Free shipping to United States with $60 purchase from AACottonCreations. See item details below for sale terms. Quilting Weight textile, Organic Cotton Fabric, BIRDS AND BRANCHES by Kirsten Sevig for Cloud9. Perfect for quilting, clothing, bedding and etc. 44" - 45" wide 100% OE100 certified organic cotton printed with low impact dyes. Choose fabric Size and Quantity in the drop-down menu when adding to your cart. I welcome custom cuts. If you don't find exactly what you're looking for please send me a convo. I'd be happy to make a custom order for you! *** Note: Colors may vary slightly due to current yarn dye lots, computer monitor projections and photo lighting. FREE SHIPPING on all US orders of $60 or more! Discount will automatically apply to your cart. International customers save $6.00 discount on shipping with your order of $60 or more. Please leave a reminder in the "message to seller" box at checkout. Refunds will be issued once order is shipped. Your order should be these sum in US Dollars before shipping cost and tax. Fast delivery, cute soft fabric. Thank you! Fast delivery, lovely soft fabric. Thank you! - A&A Cotton Creations accepts Visa, Mastercard, Discover, American Express, PayPal and Etsy gift card. - All items must be paid for within 24 hours. If you need extra time, please contact me to let me know. - Transactions not paid for within 2 days of purchase will be canceled. Any item still in new condition can be returned for a full refund minus the shipping costs or exchanged within 3 weeks of purchase (you pay all extra shipping costs). If your order qualified for free shipping during the time of your purchase, you will receive a refund excluding the shipping cost that we paid for. ♥♥ I love to see happy feedbacks from you. If you are unhappy with an item please convo me and I will do my best to work it out. I take pride in my customer’s happiness.If you need to make a return or exchange please convo me at first. Most fabric's and yarn's orders are shipped the same day or next business day. If paying by e-check via PayPal please allow for extra 4-5 days for the check to clear. All items are shipped USPS with tracking numbers. I am NOT responsible for packages once they are shipped. Packages will be shipped USPS First Class or Priority Mail, depending on the weight of the package. Orders are not shipped out on weekends or holidays. If you need your item delivered faster to you, please convo (contact) me and I will set up Priority Shipping (2 Day Delivery), with the appropriate additional charges, for you. International shipping is via USPS First Class International. This does not include any tracking or confirmation. Orders cannot be tracked once they leave the US. I am NOT responsible for orders that become lost in transit and will not offer refunds/replacements for items that become lost. If you would like to upgrade the shipping on your order to Priority or Express mail or add Insurance please contact me before placing your order for pricing. International shipments can take between 1-6 weeks, depending on method of shipment and location of country. - DUTY/TAXES: All duty/taxes that are added by your country are completely separate from A&A Cotton Creations, and are 100% the responsibility of the customer. Please know your country's duty/tax charges PRIOR to purchase. Thank you in advance!!! Now all my single patterns downloadable. Multiple pack patterns I send on email. If you have a problem with the download or didn't receive them within 24 hours, please notify me via convo or email and I will send you your order through email. Also if you have questions while knitting or crocheting don't hesitate to ask me. I love to see happy feedback from you. I try to make all my pattern as understandable as possible for every crocheter. If you are unhappy with the pattern please send me a convo, this will help me make my patterns better. As a small family business, NO REFUNDS OR REPLACEMENT FABRIC for any lost or wrongly delivered packages with proof that your package has shipped and delivered to the address provided. If you live in shared housing or do not have secure mail, please message us with any additional instructions to secure your mail. For example, we are happy to ship your fabrics "Signature Required" if this will ensure a safe and timely delivery, and we are also happy to ship to a work address. Please tell us how we can help! Fabric is cut "straight" according to the bolt, not the design or print on the fabric. This is standard practice in all quilt shops. When your pattern calls for a specific cut always order a little extra to insure you can place the pattern in the best position. Your pattern calls for 3/4 yard? Then order a yard. Scraps can be added to your fabric stash, or you can sew a coordinating accessory! Most importantly, remember we are here to help you! If you aren't sure how much fabric to order based on a fabric and pattern please message us with your specific information and we will help. 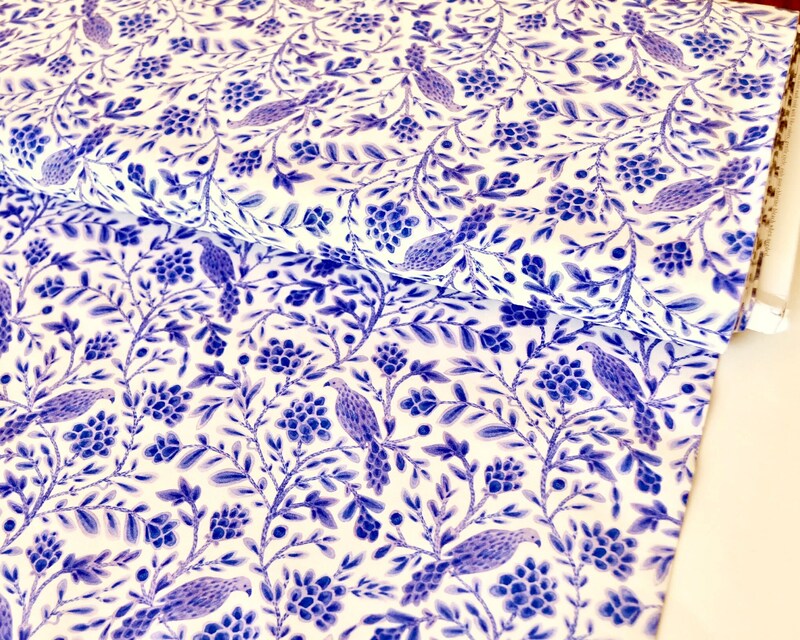 We are happy to take additional pictures showing you the scale of a print, or showing multiple fabrics together to help you choose the best coordinating prints. Count on us to help make online fabric shopping fun and take out the guess work! Fabric is available for sale on a first-come first-served basis. Custom Orders (Reserved Listings) are not held or cut until they are paid for. Please communicate notice of delayed payment and I will be happy to work with you. ***All our Fabrics are available in many sizes from 1/4 yard to 1.5 yards. If need more than 1.5 yards add quantity. Multiple quantities will be cut in one continuous piece. ***Q: What is the Fat Quarter? A: Fat Quarters measure approximately 18" x 22" (45.7 cm x 55.8 cm), including the selvages. If you purchase 2 fat quarters of the same print, the fabric will come as 1 half-yard, not 2 fat quarters. Fabric is cut in one final piece for each color. **Sunday is my "day off"....I will respond to you as soon as I can** Thank you! "Daisies Crochet" and "A&A Cotton Creations" are owned and operated by A&A Cotton Creations LLC. All of our Fabrics are available in many sizes ranging from 1/4 yard to 1.5 yards. If more than 1.5 yards are needed, utilize the quantity options. Multiple quantities will be cut as one continuous piece. Machine or hand wash cool, line or tumble dry low. What are your sizes in metric units? For orders larger than $300, I offer a 5% discount. 8% off of orders of $500 or more. 10% off of orders of $700 and more. These discounts can be used together with the free shipping offer for orders of $60 or more (US delivery only), and $6.00 off of international shipments. You will receive the bulk order discount by placing your order as you normally would and once you receive your order, you will be refunded the discount mentioned. Also, the bulk discount only applies to full yard orders (not fat quarters, swatches, or other items). Yes, we do offer samples/swatches for any fabric. Sample listing can be found in the "sections" tab on our shops home page. Fabric swatches are a great way to "touch and feel" the product before placing an order. Try a swatch first! Swatches will be approximately 2" x 4". For any fabric that has a large repeat pattern, the swatch will measure approximately 4"x6". Please note that some fabrics may not be available in a swatch size. What is your processing time? Our processing time is 1-2 business days. We do everything possible to ship the same business day. We also often ship Saturdays. For an exact shipping date, feel free to message me.